I'm losing track of the days. Looking over my notes from the last week, I somehow have nine days of notes in eight days. I can tell this is going to be an issue in the future, so I just went through my calendar and marked the ten day marks. Then Krista went through and showed me that I was a day off again. Sigh. I don't know whether to blame fasting or my own sloppy math. Of course, since the net result of my mistake would be a day less of fasting, I have to assume that my stomach is purposely conning my brain somehow. Oh, stomach. I wish I could trust you. There are a lot of people who talk about fasting as this profound spiritual experience. They say they have heightened spiritual senses and it's like the heavens open up and angels are singing to them all the time while shafts of sunlight beam down from the skies, lighting their every step throughout the day. I don't doubt for a minute that this is true for them, but that is not my experience. In fact, it has never been my experience when fasting. The first time I did an extended fast, years ago, I went in with the expectation that I would have an amazing spiritual experience. You know, visions and audible voices and insights and maybe getting caught up to the third heaven in-or-out-of-the-body-I-don't-know. But that wasn't my experience. In fact, at the end of my last fast, I remember being angry that I hadn't heard from God. Not just hadn't had a profound experience, but hadn't had an experience at all. What I mean is, I heard from God better before I was fasting than while I was fasting. I was frustrated and honestly a bit angry. A little monologue was set on repeat in my head that said something like, "Here I am, giving up food for weeks at a time, and do you even speak to me? No. You are silent. Do you realize how much I like food? I'm not sure that you do." When it was time for the last day of my fast, I set aside a whole day to pray. We were living in Asia, so I set out by myself on my bike and went looking for a quiet place in town. Anyone who had lived in our town at that time could have told you that there wasn't a quiet place there, not during the day. But I had a good day, and a long, one-sided conversation where I talked and God didn't say anything. At the very end of the day I found a big stand of bamboo near a hotel. 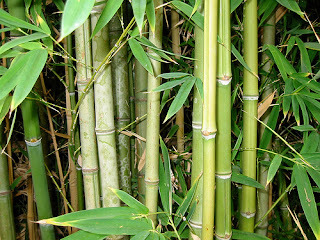 The clump of bamboo was big enough that I could crawl into it and although I could hear an occasional person walk by, I couldn't see them and they couldn't see me. There, in the bamboo, I started to have the first vague sense that I could hear God's voice. It had been a month since I had heard him speak, and now there was this sound, but without clear words. It was like listening to someone talk in another room. I honestly felt like he was in a room on the other side of the bamboo. I could feel him near me, but I couldn't hear what he was saying. I leaned toward him and tried hard to hear what he was saying. At the time, I was frustrated. He could at least have the decency to speak to me clearly after all this work I had put in to try to get more fully in his presence. But all I could hear was a sort of murmuring, the sound of a familiar voice through a wall. The only thing I heard clearly -- not just that day, but the entire fast -- was a question. It turned out later to be a pretty significant one, though I didn't realize that at that time. The question was whether I was willing to accept writing as part of my ministry. It was something I already did for fun, but the question from God was clearly something more: was I willing to have writing be part of what was expected from me as my service to God? I thought about it... the potential isolating nature of writing being the thing I was most concerned about. Then I said yes, I was willing. Just like that, I felt I was released to eat again, and that night I took communion with Krista and had a meal. It wasn't a mind-altering spiritual experience. It was, undoubtedly, significant. But I've had more intense spiritual experiences plenty of times without giving up food. Looking at the scriptural story of Jesus fasting for 40 days, I feel a little better. It's not like he had a great spiritual time bonding with God. He had forty days in the wilderness followed by three temptations from Satan. But it was a time of transition into ministry for him. I guess that's more what my previous experience of fasting has been. In regards to your whole experiement-I can't help but stop and thank you for your candor. As an author (aspiring) myself, and constantly trying to get people to stop and look at me-I loved that when I was first introduced to your project, you were up front about the fact that currently you had already completed your fast and were timing the posts with the release of your book. Well executed and noteably honest. It is one of the reasons I will ready your posts AND buy your book. Wait, are these posts not in real time? Confused. I'm not actually writing a book about fasting... but I do have another book coming out in October. I took notes during my fast and then wrote the blog posts later, scheduling them to give a sort of "real time" feel (i.e. I wrote them in the moment, not as if writing them weeks later). Mark-- yeah, these are not in real time. I ended the fast several weeks ago. I didn't think it would be good to post them as I went through the experience, and I was concerned that in some of the later days I would miss posting altogether, and I didn't want the blogging to become a central "must do this" piece of the actual fast. I took brief notes day to day and fleshed them out as I had time later.